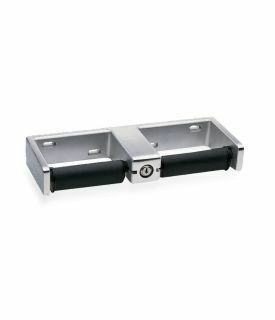 Vandal-resistant unit: heavy-duty cast aluminum, satin finish. Tumbler lock secures spindles in place. High-impact plastic spindles hold rolls up to 6″ (150mm) diameter (2000 sheets). Unit 14 1⁄8″ (360mm) wide, projects 5 1⁄4″ (135mm) from wall. No controlled delivery.